Home Costs > How Much Does It Cost to Paint a House? Whether your home is is need of a new paint job or you want to change its curb appeal, there’s one thing a homeowner can’t argue: painting the exterior of any home is going to take some work. For those who plan on doing it yourself, paint usually costs $25 to $50 per gallon. If you use about 10 gallons of paint, which can cover around 1,500 square feet, it will cost anywhere for $150 to $400 for the paint alone. This won’t include the necessary supplies such as the rollers, ladder, scraper, a tarp and power washer to prep the surface. Home Depot exterior paint, for example, can $25 to $50 per gallon. If you decide to hire a contractor, you will find that most will charge by the size of the home and will price by the square feet. This isn’t the only factor that affects the price, however. As noted below, several other factors go into the quote such as the height of the home, if any obstacles are in the way, the type of surface and geographical location. On average, a one-story house that is around 1,500 to 2,000 square feet can cost a $1,400 to $3,200, while a home that is 2,000 to 3,500 square feet can cost anywhere from $3,700 to $6,500. Typically, a painter is going to be around 70 to 80 percent labor costs, and less than 15 percent will be for supplies. Common paint types can include latex and stain, and each paint can affect the price depending on the brand and quality. Higher quality paints will be more expensive, but with this investment, you will get a nicer looking paint that can last much longer than its inexpensive competitors. A higher quality also means fewer coats and less time. The taller the home is, the more it’s going to cost. Materials can range from wood, aluminum siding, masonry, etc. The more colors you need to use, the more you can pay. How easy is it to access the house? Is the foundation steep? Are there obstacles around the home such as power lines? The more complex the layout is, the more it can cost. Do any fixtures have to be removed from around the house such as awnings or lights? Applying more than one coat can increase the cost by more than 30 percent. Some material will cost more (or less) when painting an exterior, and depending on your home’s surface, we put together a list of the most common materials a home has, along with the price range of most jobs. Before offering a quote, a painter will visually inspect the area they will paint and provide an estimate free of charge. Most professional painters will require a primer and at least two coats of paint. Before the paint job starts, the painters will power wash the areas that need to be painted to remove any dirt, moss and debris. All rotted board will be replaced and any residue will be scraped away to create a smooth service. Any areas that need to be caulked will be fixed as well. Depending on the company, they may include a limited warranty that lasts a few years. What are the extra costs to paint a house? Rotted wood is a common problem for homes that need to be painted. While some painters may include this in a quote, some may charge extra to fix these boards. Changing the paint color from dark to light may require extra coats, and because of this, additional charges can apply with the materials. Premium paint, if you decide to upgrade, will cost more than the standard paint. Painters will usually only quote the exterior paint of the home and won’t include any add-ons. This could include the doors ($100), fascia ($759), gutters ($200 to $1,000), shutters ($200 to $400), window sashes ($100 to $200) and/or porches ($500 to more than $3,000). This price range will all depend on how much needs to be done. If you’re doing the job on your own, you will want to budget for the following supplies: brushes, rollers, a sprayer, buckets, drop cloths/tarps, pans, caulk, painter’s tape, sandpaper, scrapers and a ladder and/or scaffolding for larger jobs. The cost of investing in these supplies should be less than $300. If the home was built prior to 1978, professional painters will need to check for lead. Lead tests will commonly cost about $30 to $50. Dirtier homes that require more prep work can incur additional charges. If you live in a homeowner’s association, be sure to check the bylaws. Many associations will approve only certain paint colors. If you live in a historical district, be sure to check with your local city to see what the rules are when it comes to repainting a home. Hand brushing is going to be a lot more than spray brushing. The problem with spray brushing is that it’s fast and the quality isn’t as good. With a hand painting job, the coat will be thicker, and the paint tends to last longer. 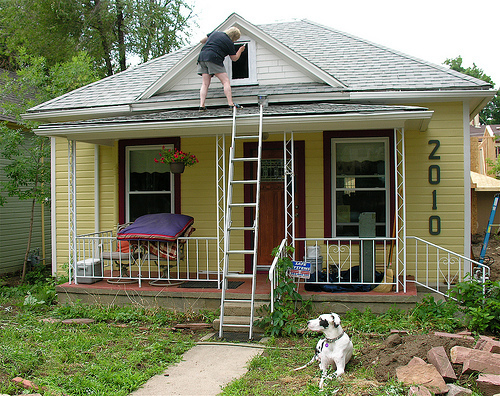 Experts recommend painting your home every seven years. What’s the difference between interior and exterior paint? All paint will be made of solvent, additives, pigments and resin, and both interior and exterior paint will have similar solvents and pigments. The real difference between the two will be in the resin and additives. Since exterior paints need to hold up to the outdoor elements, this type of paint will have flexible resins, which allow the paint to look good as the surface expands and contracts. It will also have additives that prevents it from mildew and fading. Exterior paint shouldn’t be used indoors because it can release volatile organic compounds while curing and can scuff much easier than an interior paint. Get at least three to five quotes. Many painting contractors will come to your home to offer free quotes. If you don’t have the time to research painters, consider getting multiple quotes for free from HomeAdvisor.com. Try to talk with the painters in the off-season. Since most tend to call painters during the busier months, you may be able to find a deal in the late fall. While it will be more up front, invest in a higher quality paint to make sure it lasts longer.